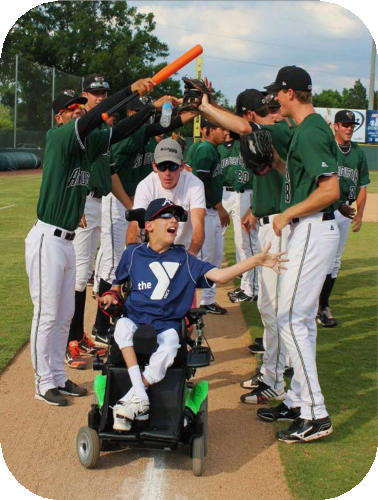 The Family Y of Greater Augusta’s Miracle League is a baseball league specifically designed for children and adults with physical and developmental disabilities. Games are played on a rubberized surface field that accommodates wheelchairs and other assistance devices. The Miracle League Field located behind the Uptown Charlie Norwood VA Medical Center on Wrightsboro Road. We hold competitive and non-competitive leagues in the Spring and Fall seasons with registration in February and July. The non-competitive league’s main focus is fun! Each player is paired with a helper called a “buddy” and everyone hits each inning and there are no outs or scores kept. The competitive league calls balls, strikes, outs, and keep score. Each player in the competitive league must be able to play without assistance. For both leagues, each game lasts about two innings or one hour, whichever comes first. For questions or if you are interested in volunteering, please contact Rina White at [email protected] or at 706 922 9597. Miracle League Baseball– A baseball league specifically designed for children and adults with physical and developmental disabilities. Games last about 2 innings or 1 hour and are played on a rubberized surface field that accommodates wheelchairs and other assistive devices. The Miracle League field is located behind the Charlie Norwood VA Medical Center on Wrightsboro Road. Financial assistance is available for all Y programs.